Heterojunctions and Metal-Semiconductor Junctions discusses semiconductor-semiconductor heterojunctions and metal-semiconductor heterojunctions, which are of significant practical importance today and also of considerable scientific interest, with worthwhile problems still to be explored and understood. Many classes of heterojunctions are believed to have new and valuable applications. Although some aspects of heterojunction behavior remain areas for continued scientific and technological study, the main outlines of the subject are clear. 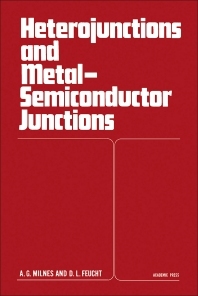 This book comprises nine chapters, and begins with an introduction to semiconductor heterojunctions. Succeeding chapters then discuss semiconductor p-n heterojunction models and diode behavior; heterojunction transistors; isotype (n-n, p-p) heterojunctions; optical properties of heterojunctions and heterojunction lasers; metal-semiconductor barriers; metal-semiconductor junction behavior; high yield photoemissive cathodes; and fabrication of heterojunctions. This book will be of interest to practitioners in the fields of applied physics.